Kind LED K5 XL750 footprint solves one of the main problems that LED lights have faced in the past. Because of historically small footprints, due to small circuit board construction, LED lights have always failed to deliver the finished harvest weights promised in comparison to their said HPS counterparts. Truly lit square footage of canopy space is a very crucial component to overall harvest weight. Now, with true footprint replacements for 750 and 1000 HPS, harvest weights are true to spec. Fully customizable spectrum allows the user to not only adjust the spectrum to match vegetative and flowering stages of their plants, but also allows for specific spectrum control for nearly any type of plant genus in applications such as greenhouse growing and in agriculture operations where crop rotation is common. Integrated Timer - Control your light cycle right from the light and remote. Internal timing function of the K5 series lights allows for more streamline setups where the user can to do away with separate analog or digital timers that can be bulky and extremely unreliable. Now, all light cycles are programmed and changed from a convenient remote. Sun Rise & Sun Set - Mother Earth function mimics outdoor sunlight conditions. Eight stage'mother earth' function allows user to mimic the great outdoors like never before seen in indoor growing, slowly waking your plants up in the morning and seeing them to bed every night. 8 separately set stages allow for light to gently turn on in the'morning' (sunrise), intensify into full power (full day sun), then gently off in the'evening' (sunset). Each of these stages can be set to the user's desired duration and desired spectrum intensities. 3 & 5 Watt Diodes Keep Light Cooler and Intense. The Kind LED K5 lights use a perfect mix of 3 watt and 5 watt diodes create the ideal amount of light going to your plants. 5 watt LED diodes are awesome. They emit an intense amount of light and have the ability to penetrate the plants canopy like no other. But, too many 5 watt LED chips, and a light can run too hot, doing away with one of the main benefits of LED lights. The K5 series lights have the best of both worlds. The'sweet spot' efficiency of the 3 watt LED chips, mixed with the harvest boosting power of the 5 watt LED chips. True to spec harvest expectations. When KIND LED says their XL1000 replaces a 1000 HPS, they mean it. In order to be a reputable company, one must not make false claims that their product can't support. Let's face it, no LED light that only draws 350 watts is going to replace a 1000 watt HPS, period. KIND LED makes reasonable product claims. They have found, through extensive testing and research, that a 30-40% savings in electricity is what you can expect from their lights. The KIND LED 1000 watt equivalent light draws about 650 watts or about 65% of what a 1000 watt HPS would typically pull. But that's just the light!! Add up all the other savings in equipment needed for heat management in a traditional HPS room, and the energy savings are remarkable. Control 1 or 100 lights simultaneously. All functions of the K5 series are run from a convenient remote. We here at KIND LED are still scratching our heads as to how most LED companies think people are able to flip an analog switch or knob to control spectrum or switch between modes on their lights when they are in the middle of a grow and their light(s) are hanging above a huge canopy of delicate plants!! Our lights are fully controlled from a convenient handheld remote. Control 1 or 100 simultaneously from one small device. Man, there are some ugly LED lights out there. Function over fashion is a must in lighting, but we have both. 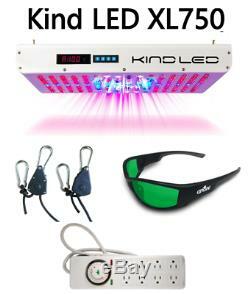 Kind LED Grow Light Komparisons. Kind LED Grow Lights use a proprietary 12 bandwidth spectrum that runs at 700mA. Lesser LED grow lights run at 500mA with only a 6 bandwidth spectrum. Thick, heavy duty 2 CM aluminum circuit boards that dissipate heat much more effectively than other LED lights, making Kind LED lights run more effectively and smoother throughout many, many harvests. Revolutionary "Secondary Optical Lens" for maximum photosynthetic penetration from plant canopy all the way down to the stem. These Kind LED lights will match or outperform any other 3 watt LED grow light, including the very expensive HydroGrow LED lights, GUARANTEED! HPS These Kind LED grow lights use only about half the electricity as HPS lights, and produce much more yield per watt. Many studies have even show an increase in oil production and quality, closer inter-nodal spacing, and denser fruits and flowers. Also, because these Kind LED grow lights produce less heat, they do not need to be air-cooled like HPS lights, therefore eliminating the need for additional fans, which also makes them run quieter. Other similar LED companies These 3 Watt Kind LED lights will match or outperform any other similar 3 watt setup that is seen often throughout the web, regardless of price or claims, GUARANTEED! You may notice that a few different 3 Watt LED lights (DO NOT EVEN CONSIDER SINGLE WATT LED LIGHTS) that look very similar to these, and as far as diode wattage is concerned, they are. What differentiates Kind LED lights is that they have more bandwidths (12), which equals a much fuller and more complete spectrum (crucial when it comes to photosynthesis). Another major Kind advantage is the use of the revolutionary "secondary optical lens" which penetrates deep into the plant canopy to facilitate easy rooting and maximize yields. Kind LED grow lights are the ONLY 3 Watt grow lights that feature a 12 bandwidth full spectrum LED panel, a secondary high intensity optical lens, and 2CM aluminum circuit boards. Dimensions: 23in x 17in x 3.5in Weight: 28 lbs. The item "NEW Kind LED K5 XL750 Series Grow Light Full Spectrum Indoor Hydro Grow Light" is in sale since Thursday, September 28, 2017. This item is in the category "Home & Garden\Yard, Garden & Outdoor Living\Gardening Supplies\Hydroponics & Seed Starting\Grow Light Kits". The seller is "ashl_mcph" and is located in Fort Collins, Colorado. This item can be shipped to United States, Canada, United Kingdom, Denmark, Romania, Slovakia, Bulgaria, Czech republic, Finland, Hungary, Latvia, Lithuania, Malta, Estonia, Australia, Greece, Portugal, Cyprus, Slovenia, Japan, China, Sweden, South Korea, Indonesia, Taiwan, South africa, Thailand, Belgium, France, Hong Kong, Ireland, Netherlands, Poland, Spain, Italy, Germany, Austria, Israel, Mexico, New Zealand, Singapore, Switzerland, Norway, Saudi arabia, Ukraine, United arab emirates, Qatar, Kuwait, Bahrain, Croatia, Malaysia, Brazil, Colombia, Panama, Jamaica.